The sun is still in a slump – still not conforming to NOAA “consensus” forecasts | Wott's Up With That? “The sun is still in a slump – still not conforming to NOAA “consensus” forecasts“. 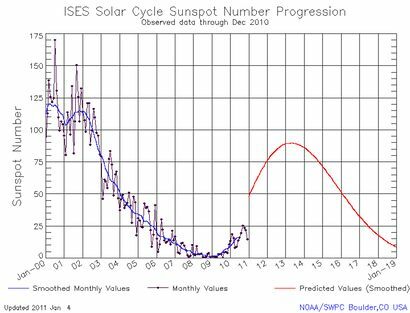 Sunspot counts are staying low, confounding predictions for Solar Cycle 24. So is the Ap geomagnetic index. Does this mean that scientists are money-wasting idiots who can’t get anything right Anthony? ISES Solar Cycle, January 4, 2011. Question: if a declining solar magnetic field, “a phenomenon that in the 17th century coincided with a prolonged period of cooling on Earth” (Science Now, Sep.t 14, 2010) means that the natural solar influence should be a cooling one, why is the global temperature rising? Is it possible that there’s some kind of… unnatural influence at work? I wonder if when solar geomagnetic activity rises again we’ll see that instead of counteracting the… uh, unnatural influence it begins amplifying it. This entry was posted in It's the Sun! and tagged Solar by Ben. Bookmark the permalink.